We combine the Asyra's diagnostic abilities with Laser Energetic Detox (LED), a therapy refined by Lee Cowden, MD, one of the most respected names in bio-energetic medicine. 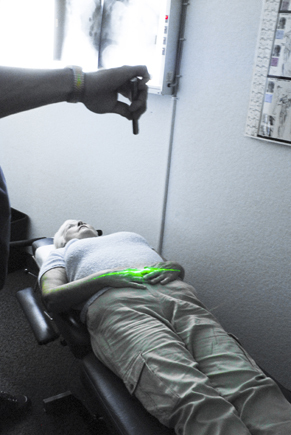 Laser light is passed through a homeopathic vile, and distributed over the body in a sweeping fashion to effect a release or resolution of the issue being addressed. It is a highly effective rapid detoxification therapy that helps alter the way toxins affect the body. Some people improve in 24 hours, rather than in weeks or months. To find out more about how Dr Tannenbaum utilizes Bioenergetic medicine, please call (954) 968-8400 for a consult. You may call him directly at (954) 968-8400, he will answer your basic questions in person or over the phone. Fritz-Albert Popps' concept of cellular communication via biophotons suggests why LED works. Sick cells simply don't produce as many biophotons as healthy cells. The coherent light of the laser may be transferring information from the homeopathic substance to the cell in a language it can understand in the form of photons. In other words, LED uses the medium of light, rather than chemical reactions, for healing. Using the Asyra, patients are tested against various stresses and toxins that show up in the body. The LED, a rapid laser detoxification process, removes stressors's allowing the body to effect change related to the illness in the manner expected if the toxic load had not impaired its optimal function. A program is then put together and tested for frequency and intervals between treatments. Asyra and LED also represent a complete paradigm shift in medicine. As people see their loved ones, friends, and business associates fall victim to chronic disease, many people want to know how to head off what may be in their future. They do not want to wait until the day their body has failed and they become "sick." They want to look into their bodies now and see where the weaknesses are and address them sooner, not later. The Asyra and LED are uniquely positioned to head off potential problems, and are powerful tools in holistic approach to treatment. As Louis Pasteur said on his deathbed: "The pathogen is nothing; the terrain is everything." That explains why one person comes down with the flu in the winter and another person does not - the second person was better able to fight off the pathogen, the virus. A strong terrain, or some might say a strong immune system, is the best defence against illness.